There’s just something about Rowan. Their yarns are beautiful, and their projects just look British to me, so refined and tasteful and pretty and classic all at once. Rowan is celebrating summer this year by offering its subscribers (it’s free to sign up) a free Summer Selects pattern booklet. It features six patterns from Martin Storey, Kaffe Fassett and Marie Walin, and they’re all tops for women. Mu favorite is probably Fassett’s, of course. 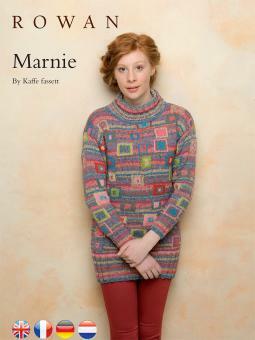 His pattern Marnie is a long-sleeved pullover with squares of color all over. It’s worked in four different yarns and a multitude of colors, so it’s much more a work of wonder than something I’d actually knit, but still. Do you knit sweaters in the summer? I’d love to hear about it!